Earlier this year, I paid a visit to Marcona, a haute sandwich shop opened by longtime reader Collier Ulrich. Since then, the eatery's been humming along nicely, slangin' sammies created by Chicago-based chef Matthew Moss. In July, the restaurant started hosting pop-ups, the first of which was Kenny Seliger's Trap Door Dining. Marcona has followed up with the Amalur Project, a new series from up-and-comers Sergio Perera and Steve Monnier than ran on October 24th and 25th. About the Chefs: Sergio Lujan Perera hails from Zaragoza, a major city in the Aragon region of Spain. He grew up surrounded by a family that loved cooking, with his grandfather serving as his key inspiration in the kitchen. He began really learning the art of classic Spanish cookery when he was 12 years old, and by age 17, was already making his way around some of the most popular places in Saragossa. From there, Perera moved to Barcelona, but grew a bit restless cooking the same traditional dishes over and over again. As such, he relocated to San Sebastián and secured a stage at the legendary Arzak, Juan Mari Arzak's vaunted temple of New Basque Cuisine. It was here where he experienced his turning point, completely reevaluating and reinvigorating his culinary aesthetic. He stayed at Arzak for three years, then moved to Japan with a friend he'd met there. In Kyoto, he worked at the friend's family's Minokichi Takesigero, a longstanding kaiseki restaurant, and also cooked at the famous Kitcho. After two years in Japan, Perera returned to San Sebastián with an enlightened point of view, and secured employment at Andoni Aduriz's well-regarded Mugaritz. He would work there for three years before moving to the United States, first landing in New York. 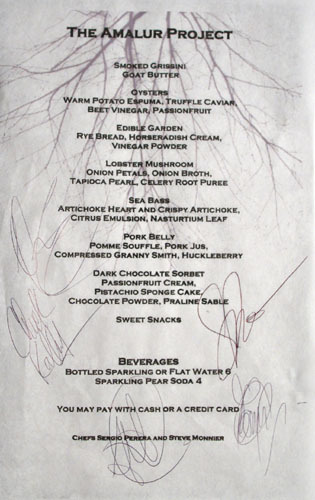 There, Perera spent two years at Jean Georges, and also cooked at wd~50 and Momofuku. The Chef then relocated to Los Angeles, working alongside Greg Bernhardt (opening chef of Church & State and former Grace CdC) and the inimitable Ludovic Lefebvre. 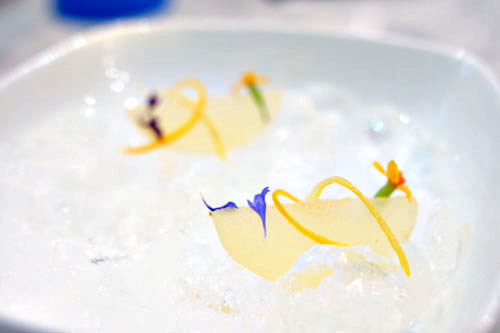 During this period, he also collaborated with the Adrià brothers at El Bulli, Tickets, as well as 41 Degrees. Currently, Perera is private cheffing and planning the opening of his first solo project. Steve Monnier, for his part, comes from Reims, a city in the Marne department of France oft recognized for its Champagne production. He was also raised in a family that was largely centered around the kitchen, and after finishing up school in his hometown, quickly made his way to the south of France. 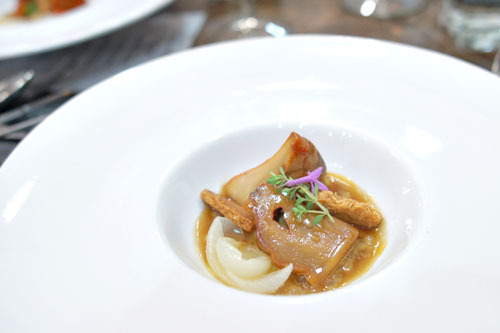 In Cannes, Monnier worked at Hôtel Martinez's Le Palme d'Or under Chef Christian Willer, focusing on Mediterranean cuisine. He eventually moved to Paris, finding employment at Alain Dutournier's two-star, Basque-influenced Carré des Feuillants. From there, Monnier transitioned to Restaurant Le Laurent under Philippe Braun, and then to the well-known Taillevent under Michel del Burgo. 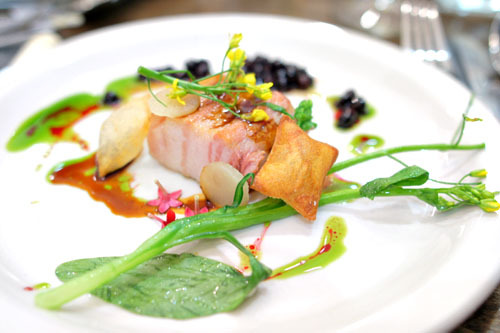 In 2002, he moved to Southern California, and spent time at Jean Francois Meteigner's La Cachette, Serge Bonnet's Cafe Provencal in Thousand Oaks, and the grand dame of French dining here in LA, L'Orangerie (under Exec Chef Christophe Bellanca), among other places. Since then, Monnier's been working as a private chef, and recently completed a stage at René Redzepi's world-renowned Noma. 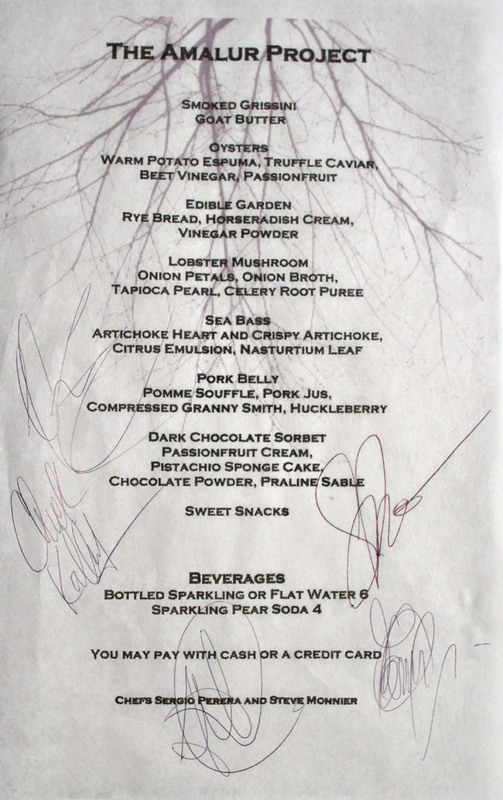 And here we see Amalur Project's debut menu, featuring eight courses for a not-unreasonable $69 per head (there was also a vegetarian option at the same price point). To drink, think strictly BYOB. Click for a larger version. To take full advantage of the BYO policy (and to pick up my copy of the new LudoBites cookbook), I stopped by local wine purveyor Domaine LA on my way over. I handed Brunellos Have More Fun's Whitney Adams a copy of the evening's menu, and she in turn suggested a trio of bottles to pair with the food. 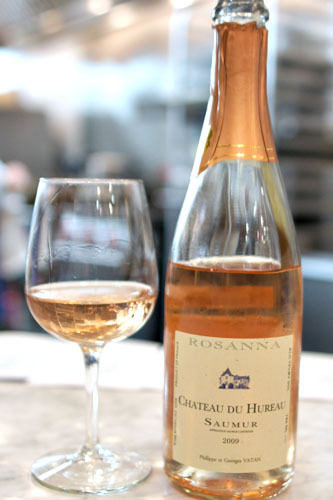 The first was the 2009 Château du Hureau Saumur "Rosanna", a sparkling Cabernet Franc-based rosé from the Loire Valley. Server Michael Nemcik (whom you may recall from the last LudoBites) popped the bottle soon after I arrived, and we both really enjoyed the wine. Think bright, fun, and refreshing, with a somewhat fruity/floral character balanced by a certain crisp dryness and minerality. Delicious alone, and lovely with the lighter courses to follow. Our amuse bouche comprised two perfectly chiseled cuts of Asian pear: dense, crisp, and bursting with bright, juicy sweetness, yet accentuated by the smoky, spicy, lingering notes from the orange liqueur. A very smart, very neat way to start the meal. 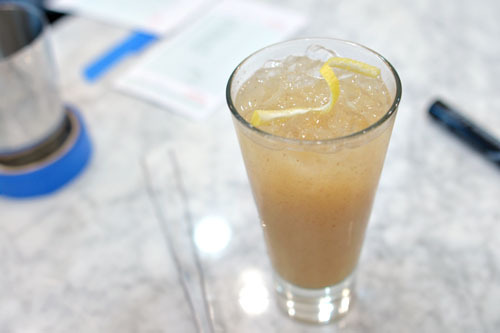 Nemcik was also offering up a special non-alcoholic libation this evening, his straightforwardly-named Sparkling Pear Soda [$4], a blend of puréed Bosc pear, cinnamon, allspice, clove, Madagascar vanilla, an orange peel-ginger simple syrup, French lemon juice, and sparkling water. Unsurprisingly, I found it rather delicious and very nicely balanced, with a great interplay between the sugary fruit and the aromatic spices incorporated in the drink. Loved the gritty consistency of the pear, too. 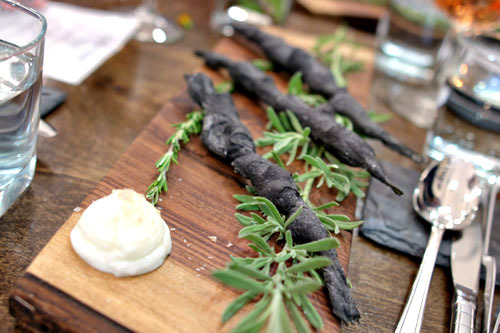 The chefs' breadsticks were superb as well, smoky and savory in nature with hints of rosemary intertwined. They were certainly tasty alone, but even better when paired with a dab of that mouth-wateringly salty butter. 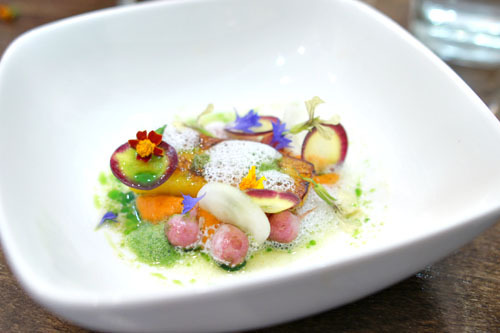 An off-menu dish featuring carrots then arrived. The sweetness of the root veggie was deftly tempered here by the included yogurt foam, while a drizzle of what I believe was olive oil added depth and gravity to the dish. I also appreciated the crunch and bitterness imparted by the radishes. Overall, just a masterful presentation of carrot, with some amazing colors to boot. Oysters arrived in two forms. The first featured warm potato cream and truffle, with the huître pairing swimmingly with the classic flavors at play, the truffle adding an exclamation point to the richness of the espuma. 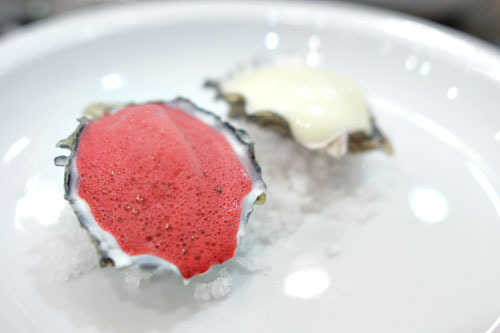 The beet-focused variation was surprisingly effective, with the sugary tartness of the beet and passion fruit combo melding smartly with the sweet salinity the oyster, all with a touch of overarching spice. 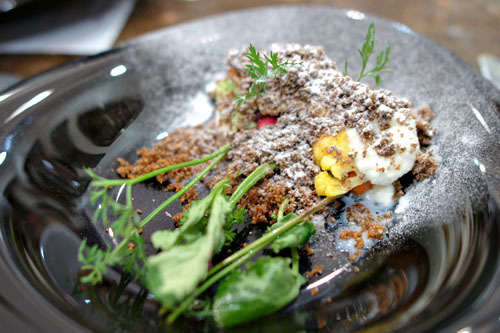 Here we had Amalur's ode to the now-ubiquitous garden-inspired dish, with carrots and cauliflower set in horseradish cream and rye crumbs. I really liked the pure, unmitigated expression of the vegetables here, their light, refreshing crunch keenly set off against the enveloping tang of the horseradish. The crux, though, was the use of rye, which lent an earthy, bitter, crunchy base to the dish that did a commendable job in tying all the various elements together. 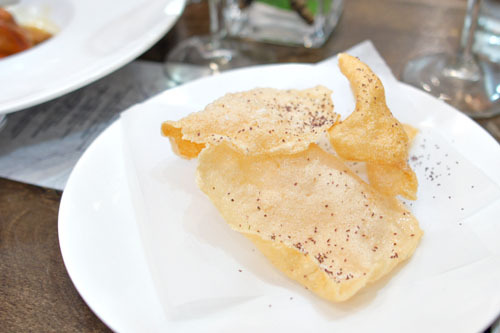 The kitchen sent out another bonus course, this time a scallop chicharrón, dehydrated and fried. It was as good as you'd expect, with a lip-smackingly saline, umami-rich taste that left me wanting more. Gimme a whole bag, please. 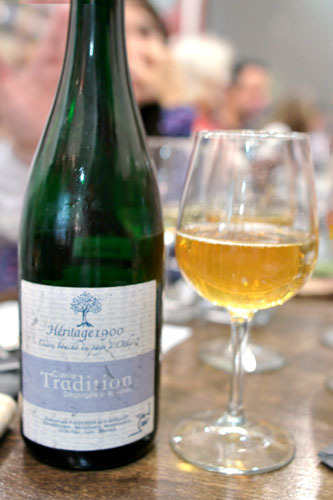 For some of the heavier courses, we opened up a bottle of the Frederic Gouison "Heritage 1900" Pays d'Othe Apple Cider from France. This was a great pick as well, with loads of bright, apple-y sweetness up front, counteracted by an almost lactic tartness and funkiness that rounded things out perfectly. Think of it as an adult Martinelli's. Interesting note: the lobster mushroom isn't really a mushroom at all. It was rather tasty though, with an immensely rich, savory, satisfying smack along with a firm, weighty consistency that made them a joy to eat. Along with the 'shrooms came onion and onion jus, both of which provided a counterbalancing astringency that worked gorgeously here. Lovely texture from the tapioca, too. Sea bass, meanwhile, showed off an intriguing, slightly-rare consistency, along with a focused brine that really did convey the notion of the fish. 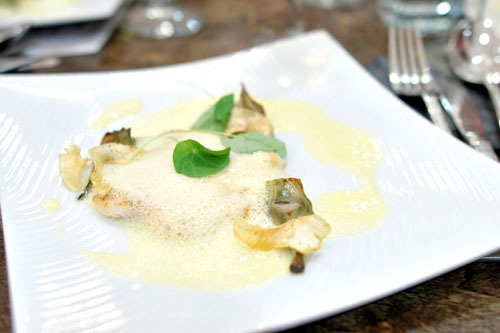 To that, the duet of artichoke contributed a moderating element, while the citrus emulsion imparted a bittersweet, almost floral component to the bass. Pork belly was as wonderful as you'd expect it to be: tender and toothsome, with a great mix of fat and lean that duly displayed the pork-y nature of the cut. I thoroughly enjoyed it alone, but also found the sweetness imparted by the huckleberry and apple surprisingly well-suited, while the levity of the greenery was much appreciated as well. Even better were the pillows of pomme, which added a fantastic saltiness to the mix. 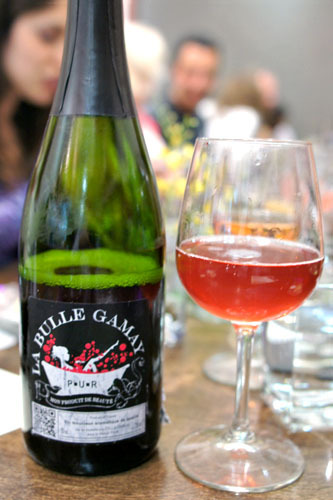 Our final wine of the night was the 2011 P-U-R La Bulle Gamay, an off-dry sparkler set in a beautiful tone of scarlet. It made sense with dessert, showing off fun, fresh, festive, fruity flavors that were easy to enjoy. 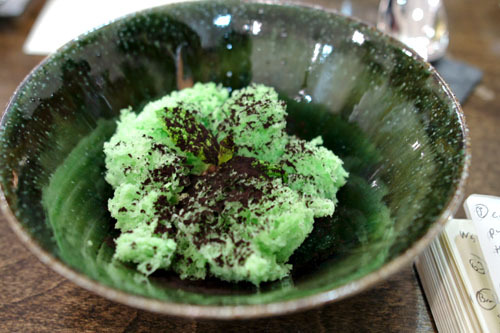 Dessert brought us a delightfully light, fluffy pistachio sponge, its restrained sweetness playing off of the intensity of the chocolate admirably, all while the praline added an interesting textural element. Note the handmade bowl here, supplied by none other than Mr. Nemcik. 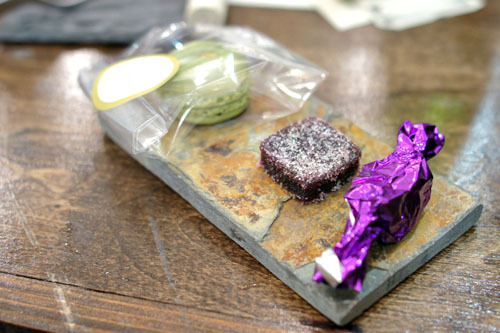 Closing things out was a troika of mignardises: a salted ginger caramel, huckleberry pâte de fruit, and green tea macaron with elderberry. Chefs Sergio Perera and Steve Monnier at the end of the first service. There's no doubt that this was one of the more ambitious dinners that I've had in recent times. In general, flavors were very robust, very focused, very "ingredient-driven," so to speak, with the essence of the produce on proud display. At the same time though, the core of the menu was modern in aesthetic, with a certain organic, naturalistic character that lent itself well to the food. It'll be interesting to see how this all evolves. 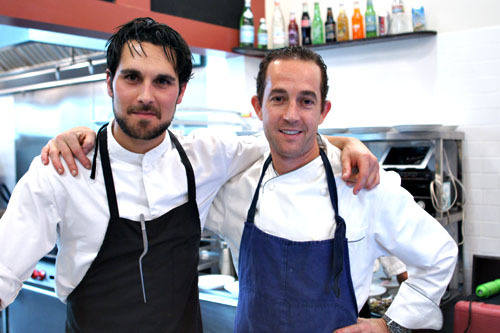 As for what's next for the duo, they plan to keep on going with these dinners, eventually adding an à la carte selection to the menu, and hope to open a permanent restaurant in the near future. I've been wanting to find lobster mushrooms, but I think their season has come to a close. I had no idea they were fungus parasites. According to what I've read, lobster mushroom season goes from July to September, so it just closed. Never actually seen them for sale though.